The Republic of Molossia has a population of four. It is presently in a state of perpetual martial law, courtesy of the ”˜foreign menace over the border.’ This border encompasses all of fourteen and a half acres, most of which can be found just outside Dayton, Nevada. There resides President Kevin Baugh, his wife, two children, three dogs, one cat, and a bunny. 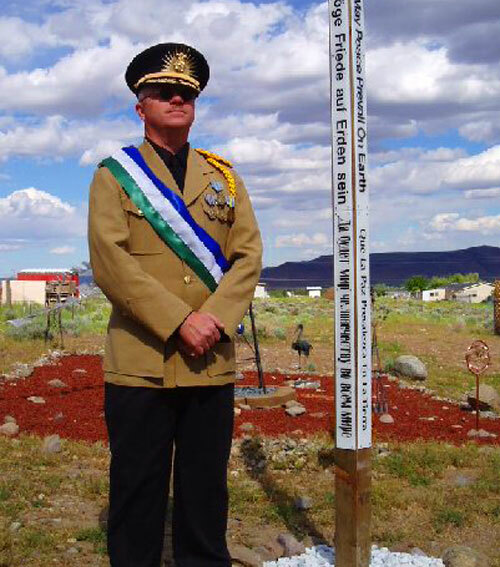 The Republic of Molossia celebrates Norton Day on January 8th, in honor of the famous San Franciscan, Emperor Norton. Emperor Norton declared himself ”˜Emperor of the United States and Protector of Mexico’ in 1859, issued proclamations and his own currency, and examined city sidewalks while dressed in an old Army uniform and a beaver hat. He was embraced by the city and its citizens, and his funeral was attended by 30,000 people. A role model for micronations everywhere, the Republic of Molossia is presently eight and a half years old. It created its first colony in 2003, and won its first war in June 2006. And if you were to stop by, you could probably have lunch with the President. Tony Hawk’s Round Ireland with a Fridge was the first thing that came to mind when I saw this entry. And what do you know, it’s the first that Amazon thinks of as well.